The "Austrian Yard" are three accormodation properties (hotel, hostel and aparthotel) waiting for you in the heart of St. Petersburg! The "Austrian Yard - Aparthotel", the "Austrian Yard - Hostel" and The «Austrian Yard - Hotel» are situated in the historical center of St. Petersburg, both offering ergonomically designed furnishings, elegant interiors, and a uniquely convenient location. Home-like atmosphere and outstanding service make both «Austrian Yard» properties international-class hotels. Our location guarantees our guests the highest level of security and protects them from the hustle and noise of city life, as well as allowing them to reach all of Saint Petersburg’s main attractions in the shortest possible time. The "Austrian Yard" hotels are situated at the heart of the prestigious "diplomatic quarter" of St. Petersburg, surrounded by consulates of the United States, Austria, Spain, Germany, and Finland. Moreover, both hotels are located inside green, secluded courtyards, with convenient parking. Our hotels are 2 minutes away from the Chernyshevskaya metro station, and only a 10 minute walk from Nevsky Prospekt. In the «Austrian Yard» hotels there are no "standard rooms" in the usual sense of the word. Guests can choose a small but well-equipped room with all amenities, or an efficient studio apartment with a modern kitchen which comfortably accommodates an entire family. At the "Austrian Yard" hotels we offer our guests a broad variety of services, comparable to the services offered at far larger hotels. But at the "Austrian Yard" hotels we give our clients the genuine personal attention that is not available at larger establishments. The advantages of the "Austrian Yard" hotels also include a flexible price policy, which is particularly favorable for our regular customers. All of the considerations above make the "Austrian Yard" hotels the perfect place to stay in St. Petersburg, whether for business trips, tourist trips, romantic weekends, or visits to family or friends. 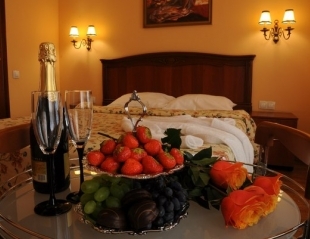 Welcome to the "Austrian Yard" hotels in St. Petersburg!